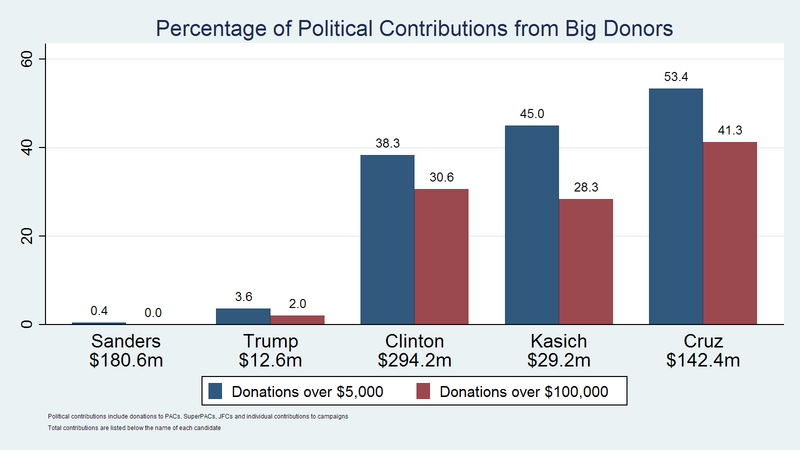 Ted Cruz remains the presidential candidate with the largest share of big donors, according to the Stigler Center’s latest analysis of the candidates’ fundraising records. The latest update of the Campaign Financing Capture Index—a new project by the Stigler Center that tracks the attempts of large political contributors to affect public policy by focusing on the fraction of total funds raised from large donors—finds that 53.4 percent of the $142.4 million raised by the Cruz campaign and by PACs and Super PACs backing his candidacy came from donations above $5,000. According to the latest available data (as of March 31st), 41.3 percent of the donations Cruz received came from contributors who gave more than $100,000. Ohio governor John Kasich’s campaign follows Cruz in reliance on big donors: 45 percent of the contributions it received have been above $5,000. 28.3 percent came from donors who contributed more than $100,000. 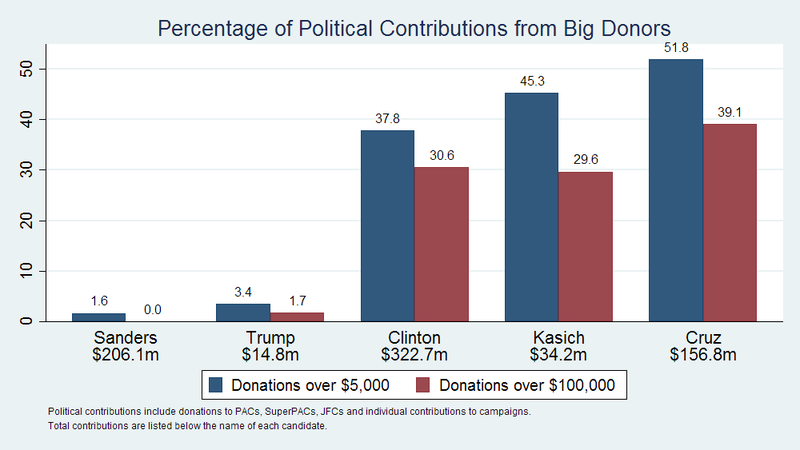 Among Democrats, 38.3 percent of contributions received by Hillary Clinton came from donors giving more than $5,000. 30.6 percent of the contributions to her campaign have been from donors who gave more than $100,000. 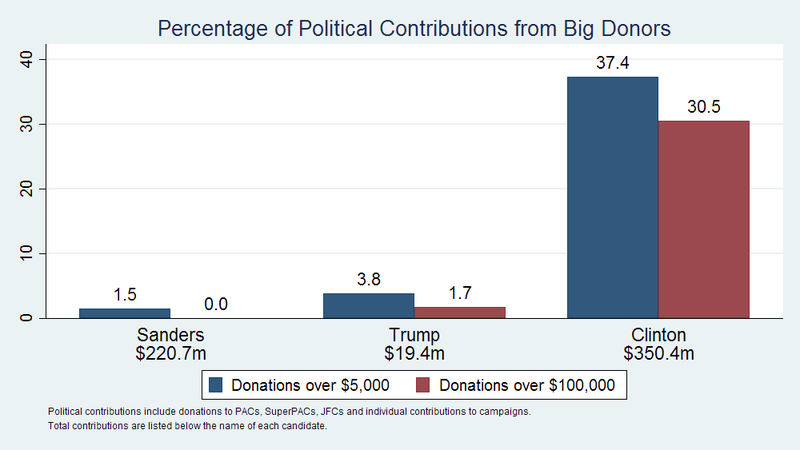 The Campaign Financing Capture Index analyzes the distribution of political contributions to presidential candidates and takes into account individual contributions and contributions made to the PACs, super PACs and joint fundraising committees that support each candidate. 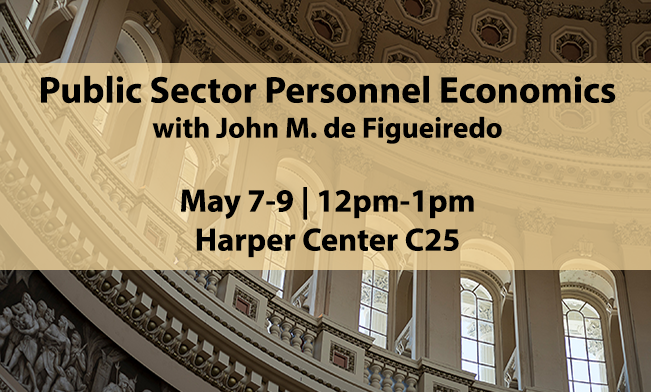 The idea behind the index is that large political contributions represent more than the mere expression of political preference, and are more likely meant to influence policy in favor of the donor’s interest. When the percentage of funds raised from large donors is significant, as it has been in recent years, this problem becomes acute. Republican frontrunner Donald Trump and Democratic underdog Bernie Sanders remained on the low end of the index in March, with Sanders receiving only 0.4 percent of his campaign donations from donors who gave more than $5,000. Trump, who has loaned his campaign $36 million so far, has raised 3.6 percent of his contributions from donors giving more than $5,000. Donations over $100,000 now account for 2 percent of Trump’s fundraising. This is a change for Trump, who as late as February did not receive any donations above $100,000. That also leaves Sanders as the only one of the five remaining candidates to not receive six-figure donations. Some of Clinton’s biggest supporters made sizable contributions in March. Cheryl and Haim Saban, for instance, donated $1 million each to Clinton’s principal Super PAC, Priorities USA Action. Financier Donald Sussman donated $1.5 million to Priorities USA Action in March, and billionaire James Simons donated $3.5 million (raising his total contribution to $7M). Cruz, meanwhile, raised $1 million in March from Gale Alger, the wife of investment firm founder Fred Alger, and another $1 million from businessman Richard Uihlein. Trump’s single large donation in March came from the film and TV producer John P. Middleton, who donated $250,000 to the Committee to Restore America’s Greatness, a Super PAC that supports Trump. 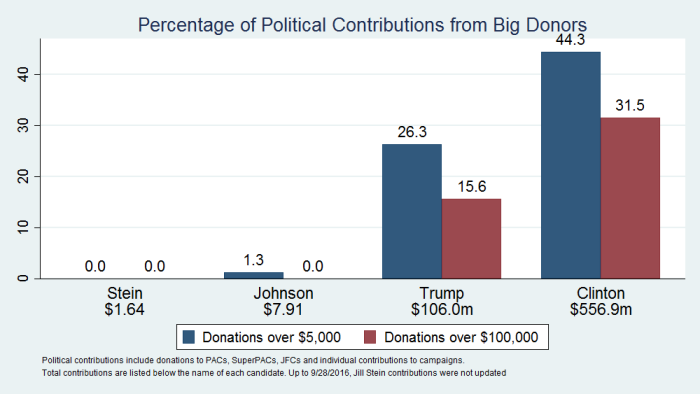 The analysis was done based on data collected from the FEC website, and comprises all the contributions made to campaigns, super PACs, leadership PACs, Carey PACs and JFCs since the beginning of the race until March 31. The Stigler Center will publish a concentration and distribution analysis every three months until the presidential elections.